Review: Wow this book contains one secret revelation after another after another. But at the heart of it all though is Lucy Diamonds unfailing potimism and a hugely strong sense of family and family ties. 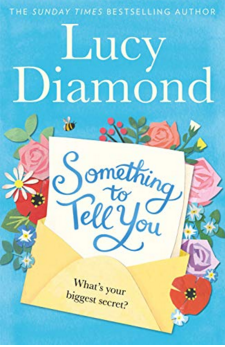 When I began reading this book, I couldn't work out how the three main storylines were connected or how they weer going to come together but then I began to work out who was who and how they related to one another and the storyline began to weave before me. This book really does have a large cast and so you may was to take reference as you are reading so as not to loose track. The main storyline though concerns three mothers and their love for their families. Not only do these women love their families though, they recognise the importance of their own identity and not losing that and so their stories are really quite empowering. I loved the way these characters all related to each other as the story unfolded and there were definitely a lot of 'ah ha' moments from me as it progressed. I listened to this one on audio and so that might be why I had trouble keeping track of who was who initially. Some of my favourite characters were Bunny, a slimmer of the year with some serious skeletons in her closet, Frankie, someone who is really struggling with her identity since a whole host of ghosts from the past have come to haunt her and Paula, the one who is just trying to do the right thing and keep it all together. Yes this story is sometimes complicated but that does make for a whole host of drama. With revelations taking place left right and centre, there is never a dull moment in this book and it will definitely keep you guessing as to how it is going to conclude. The majority of this book is set in a part of the world I am very familiar with, North Yorkshire and so it was great to be reading it here in Denver and getting a little taste of home, I even gave a cheer when Knaresborough was mentioned. I can definitely recommend the audiobook as it was well narrated and allowed me to read 'on the go' but if you have trouble keeping track of a large cast of characters then perhaps the hardback would be a better purchase so you can refer back to whole belongs to who if you get lost! I can't wait to find out what Lucy Diamond throws at her characters next!